Inviting rooms and comfortable apartements in the middle of nature, typical South Tyrolean cuisine and Italian specialities with high quality meat from our farm. Welcome to Gasthof Appartements Premstl in Martell! 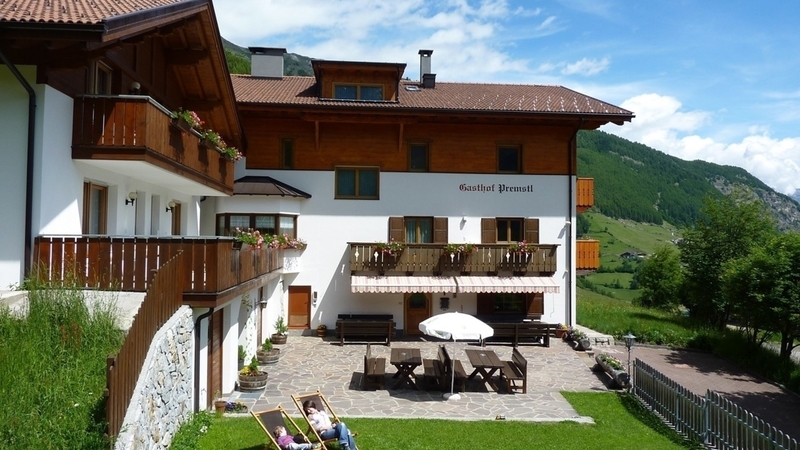 Gasthof Appartements Premstl is located only five minutes from the village of Martell, in the valley of Vinschgau, on 1,550 m above sea level and surrounded by nature, the beauty of the mountains and absolute tranquillity. At our family-run guesthouse, you will immediately feel like at home and spend unforgettable holidays. Our guest are offered inviting rooms and apartments. The rooms dispose of a bathroom with shower, WC, hairdryer, satellite TV and a balcony, which offers a dreamlike view over the mountains of the Martell valley. Our four apartments, however, are approx. 48 m² large, well-equipped and suitable for 2-4 persons. The apartments are composed of a bedroom with safe, a bathroom with shower, WC and hairdryer, a living room with fully equipped kitchenette, satellite TV, as well as a balcony or a large terrace. Two apartments provide an original woodstove too. A parking lot is situated right next to the house, in part covered. We offer free Wi-Fi in the entire house. Our garden is the ideal place for relaxing and sunbathing and is particularly loved by our little guests. Every morning, we pamper you with a rich and nutrient breakfast, which you can also enjoy on our sunny terrace. In the evening, we serve specialities of the Tyrolean kitchen, as well as Italian delicacies. Large part of the ingredients – notably the meat – comes from our own farm. The Premstl guesthouse is a good starting point for countless hiking tours and excursions in the mountains. Franz, the owner, is a professional mountain guide and knows the territory like nobody else. With pleasure, he will help you planning your tours. Apartment with living room with fully equipped kitchenette and high quality sofa bed for 2 people, separate bedroom with safe, and bathroom with shower, toilet and hair dryer. WiFi, digital Sat-TV and Sat-radio and a balcony or generous patio. Home made products, Sunshade, Deckchair, Multilingual receptionists by day, Pets allowed, Quiet position, above 1000 m a.s.l.